Picture courtesy of Tom's Aviation Images. 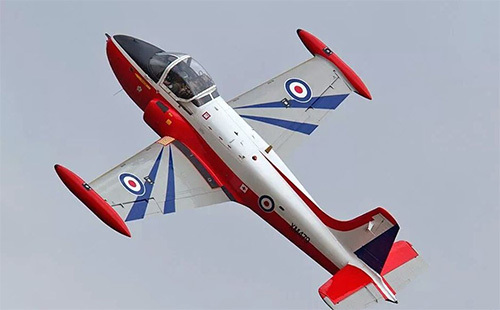 For more information see also the Newcastle Jet Provost website. Of course this won't be the only attraction, the air show will also feature aerobatic displays from a 7/8 Spitfire replica, a Pitts Special biplane, two Vintage Tiger Moth biplanes, a replica of a WW1 biplane fighter, the SE5, and a home-built Glasair monoplane. Several vintage vehicles from Islay motor club will also be on show. Given the important part the airport plays in supporting the island economy and in connecting us to the mainland, we are delighted once again to be hosting the Islay Airport Open Day and Airshow, in partnership with The Museum of Islay Life. The air show is a popular family day out and we are looking forward to welcoming spectators to this year’s event, which promises to have some fantastic attractions. Tickets can be purchased on the day, costing £5.00 for adults, with child and concession tickets costing £3.00. Family tickets (2 adults & 2 children) are priced £12.00. Entry for children under five is free.